A zippered, pillow cased tension fabric graphic with a 3″ diameter, heat sealed projection hole, sized to fit a 10′ × 8′ Vertical Curved Frame. Made from environmentally friendly Green Knit material that is machine washable, wrinkle resistant and fire retardant. Standard finishing includes a Clean Fit Backer to produce the cleanest and smoothest graphic cover available. It covers the back and is not visible when the display is viewed from the front. Choose from one of five stock colors. There is a large array of interchangeable components available to tailor this trade show display to your unique marketing needs. For questions about adding to or modifying a display configuration please contact us. *Print-ready artwork must be submitted and approved at least 15 business days prior to desired delivery date. For available rush options please call. 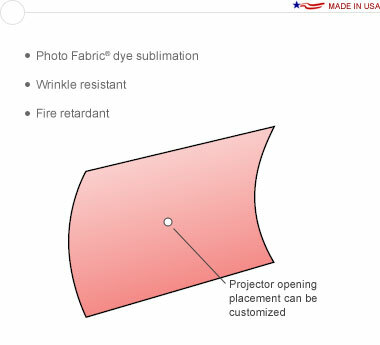 Fire Retardancy · All fabrics are certified to meet or exceed the following: NFPA 701; California State Fire Marshal's Section 13115, Title 19; ASTM E84; German Fire Code DIN 4102/B1. The appropriate Fire Retardant Certificates are included. Non stock colors are available for Clean Fit Backers at an additional charge. Projector opening placement can be customized. Please see graphic template.